Percutaneous stenting of coarctation of aorta is a known treatment for selected cases in children. Displacement of the stent may occur during or after this procedure. Stenting of the right circumflex aortic arch (RCAA) with a coarctation has not been reported before. We report stenting of a previously reported child with Goldenhar syndrome who underwent coarctation stenting in two sessions. We discuss the predisposing factors for stent migration in this particular setting and the tips to avoid this complication. 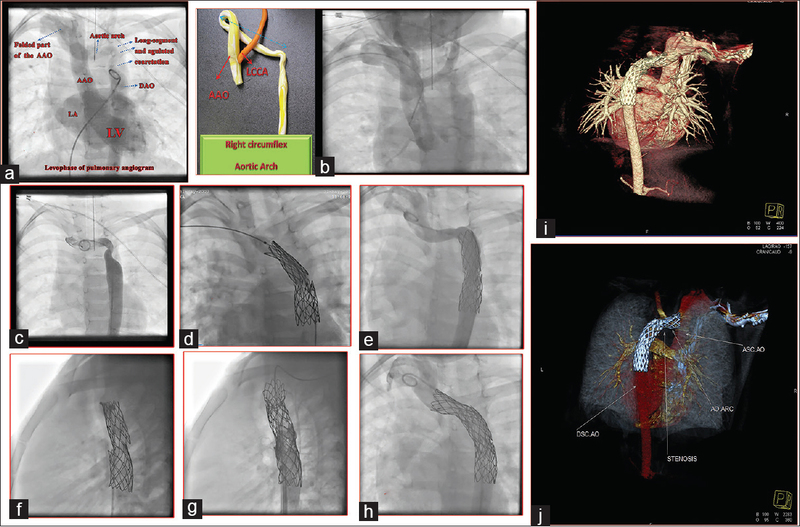 An 8-year-old child, with a weight of 26 kg and a height of 105 cm, with the diagnosis of coarctation of an angulated RCAA, was referred for elective stent angioplasty. He was one among a dizygotic twin pregnancy diagnosed with Goldenhar syndrome, severe coarctation, and RCAA [Video 1]. According to the parents' choice, the child underwent cardiac catheterization at the age of 7 years, and coarctation stenting was performed 1 year later. The diameter of the aorta at the narrowest segment was about 5 mm, and the diameter of the aorta at the level of the diaphragm was 13 mm. The measured length of the coarctation for stenting was mistakenly measured at about 85 mm. However, we did not have the proper – sized stent. There was no pressure gradient on withdrawal pressure tracing from the left ventricle to the ascending aorta. Coarctation stenting of the distal arch using a bare 34 mm Cheatham Platinum (CP) stent mounted on a 12 mm × 40 mm Z-med balloon catheter (NuMED Inc., Hopkinton, NY, USA) resulted in stent displacement into descending aorta [Video 2],[Video 3],[Video 4],[Video 5],[Video 6],[Video 7]. Deployment of the second similar stent also was complicated by a similar distal stent displacement into the vertical part of the proximal descending thoracic aorta [Video 8]. There was a vertical misalignment between the edges of these two displaced nonoverlapping stents During the second procedure after 3 months, a covered premounted 45 mm, 8 zig CP stent mounted over a 14 mm × 4 cm Z MED was deployed across the narrowed transverse arch to abolish the gradients [Video 4]. Another 16 mm, 8 zig covered CP stent was also implanted over a NuMED Nucleus™ 14 mm × 30 mm to correct the vertical misalignment between the two previously implanted bare stents [Figure 1] and [Video 9],[Video 10],[Video 11],[Video 12]. At the end of the procedure, the pressure gradient between prestent segment and poststent segment decreased from 45 mmHg to 0 mmHg across the stents. Of note, the pressure gradient did not change after the deployment of the second covered stent. Furthermore, the 20 mmHg pressure gradient across the narrow segment was abolished. After 2 years, the child remains symptom-free with normal blood pressure without any medication. However, in the last follow-up visit in December 2016, there was 35 mmHg PG across the stents on echocardiography. The left subclavian artery (LSCA) was hypoplastic and filled late in the initial aortography [Video 13], indicative of an isolated LSCA. LSCA was not in the vicinity of the coarctation stenting. Fortunately, despite having the substrate for a vascular ring as previously reported, the patient developed no respiratory symptom or difficulty in eating solid foods after the stenting [Figure 2]. Increased curvature and tortuosity of the transverse arch in the setting of right circumflex aorta led to underestimation of the length of the stents chosen initially. The angulation between the transverse arch and descending aorta further increased the kinetic energy of the turbulent flow and the resultant displacement forces on the stent. This led to distal stent migration. Roos et al. discussed the complex factors influencing migration of stents. They indicated that the distal displacement forces are significantly increased in the bell-bottom-shaped stent. The configuration of their bell-bottom stent is very similar to the geometry of the aorta in our case [Figure 3]. Stent migration occurred in the setting of RCAA with angulated coarctation, due to the “reverse-tapering” configuration, the tricky angle and curvature of the aorta, selection of a shorter stent. Not doing rapid ventricular pacing, improper centering of the stent on the balloon on the first attempt and not using a balloon-in-balloon also could have contributed for distal stent migration. Use of a longer premounted stent facilitated successful completion of this procedure. Use of premounted stents and open cell design stents like IntraStent DoubleStrut LD stents also seem to be helpful in proper stent deployment in these settings. Yang L, Chua X, Rajgor DD, Tai BC, Quek SC. A systematic review and meta-analysis of outcomes of transcatheter stent implantation for the primary treatment of native coarctation. Int J Cardiol 2016;223:1025-34. 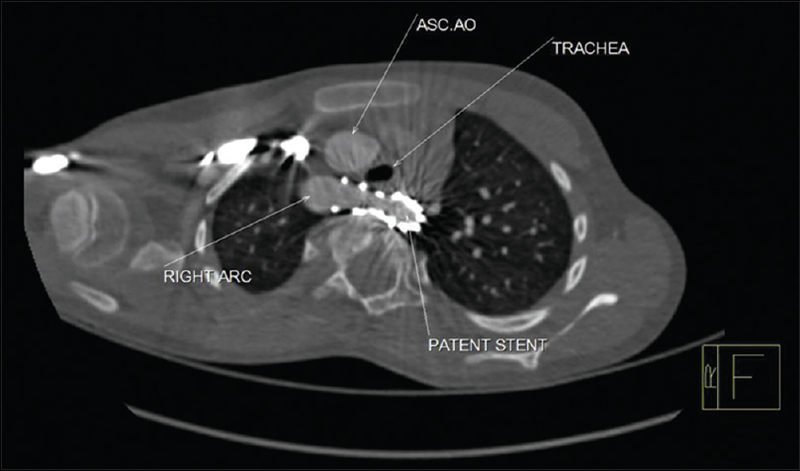 Forbes TJ, Gowda ST. Intravascular stent therapy for coarctation of the aorta. Methodist Debakey Cardiovasc J 2014;10:82-7. Rad EM. Goldenhar syndrome with right circumflex aortic arch, severe coarctation and vascular ring in a twin pregnancy. Ann Pediatr Cardiol 2014;7:217-20. Roos H, Tokarev M, Chernoray V, Ghaffari M, Falkenberg M, Jeppsson A, et al. Displacement forces in stent grafts: Influence of diameter variation and curvature asymmetry. Eur J Vasc Endovasc Surg 2016;52:150-6. Rutledge JM, Mullins CE, Nihill MR, Grifka RG, Vincent JA. Initial experience with intratherapeutics Intrastent Doublestrut LD stents in patients with congenital heart defects. Catheter Cardiovasc Interv 2002;56:541-8.